The Camden County (NJ) Police Department is looking for a missing 16-year-old from Centerville. 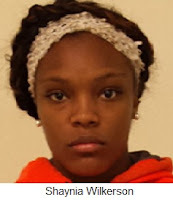 Shaynia Wilkerson was reported missing today from the 600 block of Woodland Avenue. She is described as a black female, 5’2”, 125 pounds, with brown eyes and black hair. She was last seen wearing black tights, sandals and a black jacket with lace. She has been reported missing previously and was last seen on the 1800 block of E. Allegheny Avenue in Philadelphia.